One of the earliest cases of overexploitation and pollution in Europe has been found in SE Iberia, a key center of Early Bronze in Western Europe (Argaric civilization). 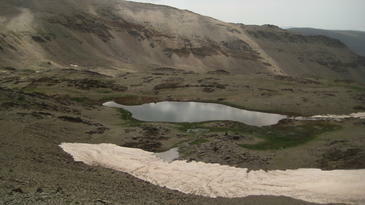 The sediments of a lake in Sierra Nevada (Andalusia), known as Laguna de Río Seco (pictured), have provided the evidence for important pollution c. 3900 years ago, just when the Bronze Age began in the region. This is attributed mostly not to industry but to increase in fires and deforestation. However, as we get into the Late Bronze (post-Argaric culture) and Iron age (Iberian culture), the evidence speaks of a type of pollution which can only be attributed to manufacture: lead. This kind of pollution reached a peak c. 2900 years ago (beginnings of Iron Age) and then again in the Roman era (as well as in the Industrial Age). It is worth mentioning that lead pollution has decreased in the last decades, caused no doubt by the environmental awareness of these times and derived normative, like banning lead from gasoline. Sources: SINC[es], Paleorama en Red[es]. Arguable I guess because it will be susceptible to further research for example in the Castro do Zambujal (Torres Vedras, Portugal) or in the El Argar culture area itself but that is what the current archaeological team has claimed through a press release (h/t Pileta). According to the researchers, La Bastida[es] de Totana (Murcia) was back in the day the largest city in all mainland Europe, next only to some Minoan cities of Crete. On first read it may sound to exaggeration but, after all, they have pushed forward the age of foundation of La Bastida and hence of El Argar culture to c. 2,200 BCE, some three or four centuries before El Argar proper… what means an older age than the founding of the Mycenaean cities (Mycenae, Athens, Thebes…), which are not older than c. 1600 BCE. 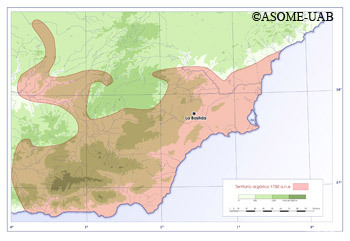 The civilizations of Los Millares and the already mentioned Zambujal (culture of Vila Nova de Sao Pedro), both in Iberia, are still older (c. 2600 BCE) but now La Bastida de Totana stands between these Chalcolithic civilizations and the Bronze Age ones, whose paradigm is El Argar, of which La Bastida may have been seed. 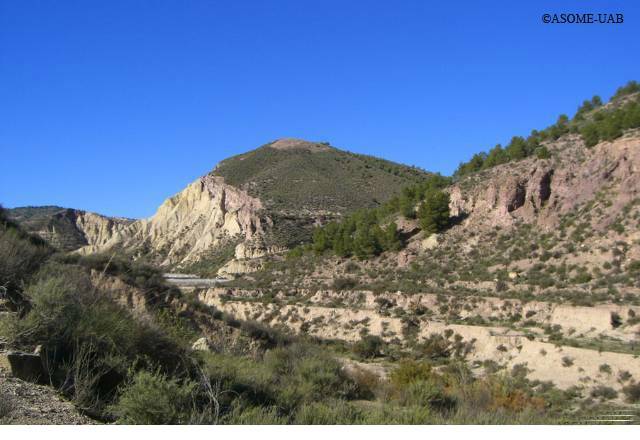 Hill of La Bastida (Totana, Murcia) – source: La Bastida[es]. original height of the defensive wall was approximately 6 or 7 metres. arched postern gate, or secondary door, located near the main entrance. and Jordan), influenced by the civilisations of Mesopotamia and Egypt. Bastida after the crisis which devastated their region 4,300 years ago. these innovative methods into their military architecture. 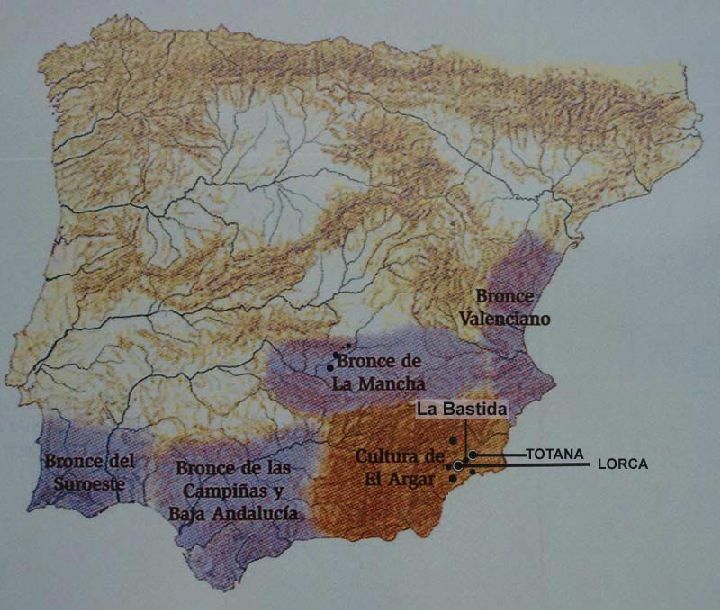 For what I have read on the matter, I understand that El Argar culture, often imagined as a centralized state, would have been divided into three regions or smaller realms, of which the area of Totana and Lorca (roughly modern Murcia region) would be the northern one. From the pushing backwards of the age of La Bastida I deduce that the this region may well have been the origin of El Argar civilization itself, which surely absorbed Los Millares manu militari later on, maybe leading to the founding of El Argar city as new capital between the two realms, much like Memphis was founded in Egypt after the unification of the Upper and Lower kingdoms. I am here speculating a bit of course – feel free to correct me if you know better. In the La Bastida dedicated site you can find much more information in Spanish language, as well as photos, about this fascinating site, which was maybe the navel of much of Europe four thousand years ago. Another complementary source for this entry has been the dedicated page of Murcia regional government. Thanks to both. Archaeological works at the Motilla del Azuer, in the steppary region of La Mancha, SE Spain, made an unexpected discovery: the skeletal remains of a man in his 40s who suffered a broken hyoid bone but survived the normally deadly injury. This bone, placed around the base of the tongue, is often broken in case of strangulation (including hangings) but otherwise a rare lesion. However the very fact that the man survived suggests to researchers that in this case the lesion was caused by a direct impact. Full story at Unreported Heritage News (paper to be published at Journal of Osteoarchaeology). 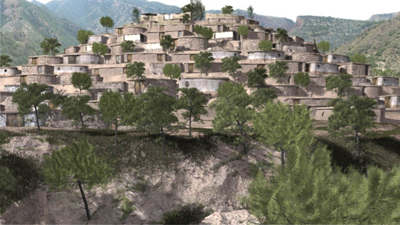 More information on the archaeological work at Motilla del Azuer at Science Daily (2007). The Motillas are fortifications, rather similar to the more famous Sardinian Nuraghe, erected at La Mancha in the Middle Bronze Age and abandoned a few centuries later. Culturally they are more akin to the Bronze of Levante (Valencian Country) but are surely also related to the regional power of the age: El Argar civilization (Almería, Murcia). This group of cultures is surely at the roots of historical Iberians. El Argar and its hinterland was the core of the Iberian Bronze Age, beginning c. 1800 BCE. They are probably the ancestors of historical Iberians and were at a later stage (since c. 1500 BCE) influenced to some extent by Mycenaean Greece. It was in this B phase of the Middle Bronze Age, when the inland fortifications known as Las Motillas in Spanish (exactly the same concept as motte-and-bailey in English) were erected to live for about two or three centuries. I believe that their construction in this otherwise uninteresting steppe (showing little signs of habitation before and after them) was triggered by the need of El Argar (surely a centralized state) of securing a safe inland route towards NW Iberia, which was like the Persian Gulf of the Bronze Age because of its huge reserves of tin, an otherwise rare metal necessary for the forge of bronze. The rest of the route would go (possibly) through the lands of the cattle-herder peoples of Cogotas I culture in the Iberian Plateau. An alternative route was through the sea but there it had to go by the coasts of another (maybe rival) power: Zambujal (Vila Nova de São Pedro culture). Some of the produce would surely remain in Iberia (El Argar and allies) but much, I understand, would be exported to Greece, where it would have fed their militaristic tendencies maybe (culminating in the destruction of Troy and much of the Sea Peoples‘ episode). No Greek outpost is known to have existed anywhere in Iberia but Greek burial styles were adopted by the Argarians since c. 1500 BCE, strongly suggesting they were trade partners. Otherwise only a few glass beads of Oriental origin attest the trade which must have been mostly about raw products such as tin, copper, gold and silver.